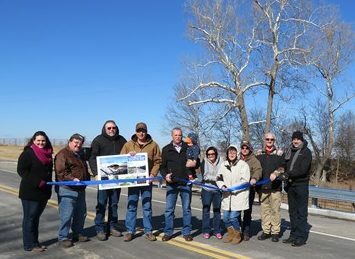 A ribbon cutting for Bridge #149 over Hickory Creek was held on February 12 at 11:00 am, according to Commissioner Russell Earls, Ottawa County District 3. The old Bridge #149 was a continuous concrete slab span bridge built in 1939. The new bridge is a 64 ft arch span bridge that was designed by Guy Engineering Services of Tulsa, OK and constructed by RRY Services, LLC. It was constructed on the same alignment, and EW-23 was closed during its construction. 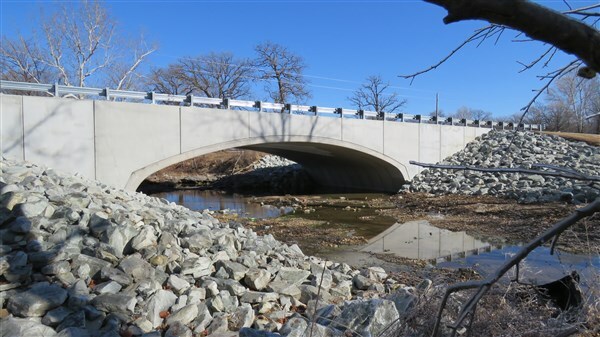 Design and construction of this bridge was challenging due to a Karst feature located 2.0 ft south of the proposed grading limit. A Karst feature is a geological formation shaped by the dissolution of soluble bedrock such as limestone. The Karst feature near Hickory Creek is a natural spring that also provides habitat for endangered species. During construction, the contractor discovered during excavation that this Karst feature extended to an area under the east abutment. GUY Engineering worked with ConTech Solutions to provide an alternative footing design within a month. Funding for the $1.2 million bridge was provided by County Improvements for Roads and Bridges (state funding).